Words can be kind and they can also be cruel. We say things everyday without sometimes realizing how they may affect the person you may be talking to. Now before you cry, so what you can’t tell jokes, hell yeah you can tell jokes. The issue involves not knowing whether someone in the audience may have painful experience. Now this doesn’t require a tailoring but it can guarantee it will cause a reaction. People seem to think they are still talking to brick walls when they say anything. Usually you are speaking to a person or a group of people. Thoughts and emotions linked to words can sometimes be beyond our control. Now the statement is highly ignorant and borderline racist stereotyping of a whole continent. 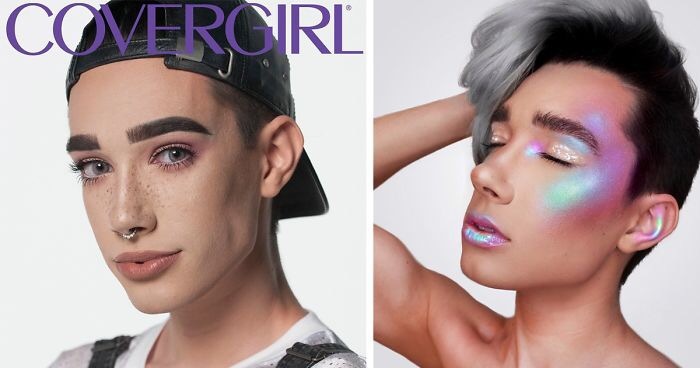 Now while most people would have lit up into him and educated him, the real issue is that he is CoverGirl’s first male ambassador for the brand. His profile therefore has been elevated And so this supposedly ” innocuous” tweet has taken on a bigger life than its own. Once the wildfire was stoked, then damage control kicked into overdrive. Covergirl posts a #tbt of a video of him and the wonderfully amazing Zendaya doing makeup together as if to say “look he isn’t a bad kid. He plays nice with black people. Come on Covergirl. You know better. This is not the environment to try and placate people. Step up and show actual empathy. He begins semi belligerent because his manager probably told him you need to say this or that. He states he is going to Africa for education and to learn more about this country. Um. Last I checked Africa is a continent with 55 countries within. 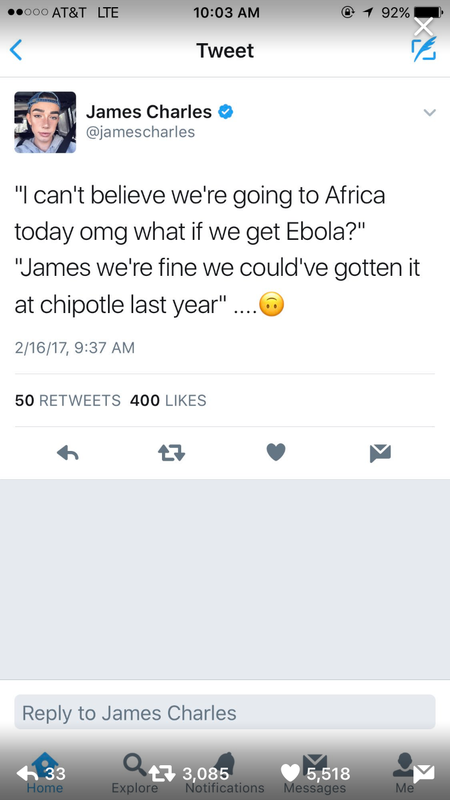 Africa is not a Third world continent. Africa is a fully functioning economy that has aspects in certain countries throughout the continent that need changes but that can be said for any nation. 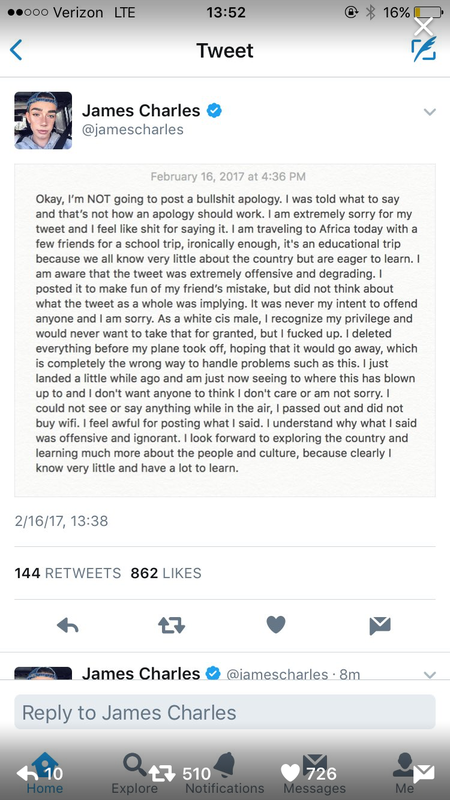 Most people on Twitter felt that he should have saved his apology and I have tendency to agree. Most people only apologize because they are forced to do it never seems sincere. So everyone is kinda waiting on Covergirl to acknowledge this behavior and do something. Just like how Disney and YouTube Red decided to drop Pew die pie from contracts due to an anti Semitic video. 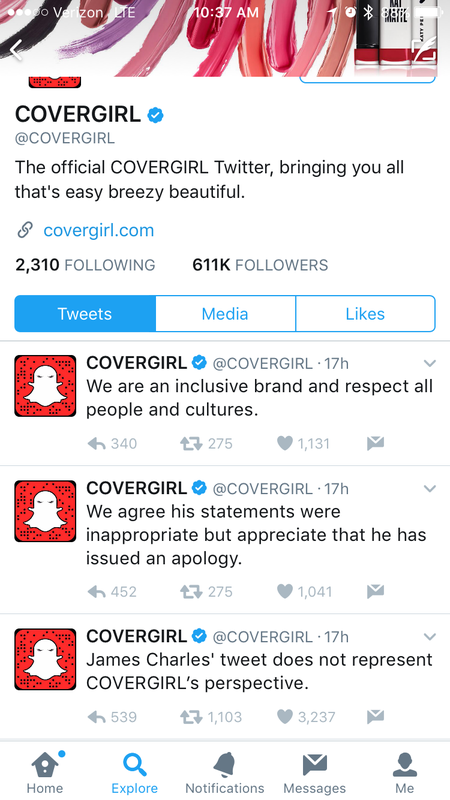 Now, people are looking at Covergirl like ” his statement may not represent your perspective but he is a brand ambassador for your company.” If they let him continue as that the message will be loud and clear that ignorance is fine as long as one of our executives doesn’t say it. We stand for ignorant people as long as they apologize and learn. Do you know how people learn lessons today?? $$$$ and ¢¢¢¢. People always need to be hit the pocketbook for them realize that what you do has consequences. Who knows how it will end for Mr. Charles or Covergirl but this political climate we are currently in has no problem with boycotting brands or people for one misstep.